This effects on our website photomica - the online photo editor will help you get the desired image onto the superman's body. 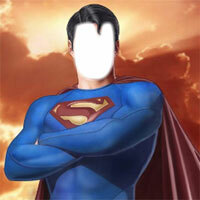 One can fix his or her face on the superman's face and look like the superhero. You can upload your pics on the facebook, twitter or any other social media website. One can use this effects to have fun with your partner. Get his face into the superman's costume through the Face in hole superman - Faceinhole online effect and you can put that wallpaper on your phone to show him affection for your hero. One can also take a printout and out the pic on the greeting's card. There can be endless options so get ready for fun.